Senior mathematics and psychology major Olivia Tolberd prepares to hit an incoming volleyball. 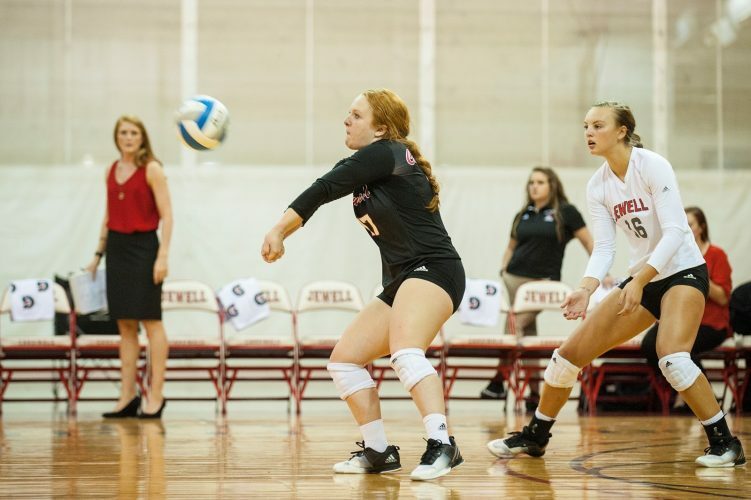 Olivia Tolberd, senior mathematics and psychology major, spoke to The Hilltop Monitor about playing volleyball at William Jewell College and how it’s shaped her time at the institution. Tolberd began by telling the Monitor about how she stays competitive in the sport while balancing a busy school life and how the sport has helped her interpersonal skills. I also think it’s made me able to, like, handle different people, because all of us on the volleyball team are different in every way, but we all find a way to get along and have fun and be friends with each other. So I may not understand her point of view, but I’m still able to respect her point of view. Having that mentality of like not always getting along with people but making it work with them, especially when we’re frustrated. In the middle of the game where you’re losing, you can’t sit there and be a turd to people, you have to find a way, in a respectful manner, to be like ‘you can do this, let’s go, you do your job I’ll do mine’ kind of thing. I’ve always been competitive, too — it helps drive me to be competitive. It gives me an outlet for that,” said Tolberd. She continued to talk about her beginnings in the sport and how her early start and familial ties to volleyball gave her skill for the game before she began playing. Originally a setter, Tolberd switched positions when she first came to Jewell and has been playing as a D/S Libero ever since. “I’m a D/S Libero, so I pass in the back row – I don’t hit. [I had to switch positions because] I’m too short. So usually the older you get you want a taller setter you can eventually go front row and be a blocker, but being 5’3” I don’t get to have the height advantage. So I decided to go passing,” said Tolberd. After switching positions due to her height, Tolberd has been able to compare the two and has noted different advantages and disadvantages to being 5’3” in a height-centric sport. “I’m closer to the floor so I can get down faster, and it’s easier for me to dive, but at the same time if a ball is hit high I have to really jump and sometimes I can’t even jump high enough to get it. There’s kind of a joke that I need to be one foot taller, but it’s also kind of nice because, like, a tall person who’s diving will take longer [than I would],” Tolberd said. An additional benefit is that Tolberd, due to her natural height and intensely practiced skill, has become an exceptional digger and is, at the time writing, only 34 digs away from breaking the career record of 2,118. Tolberd spoke about how she has gotten to a point in her collegiate career that she will most likely break the record. Tolberd excitedly told the Monitor that she is likely to break the career record within the next two volleyball games, both of which are at home. For those wanting to support the volleyball team as well as catch the record-breaking game, the Cardinals play Friday, Sept. 28 at 7 p.m. against Bellarmine University and Saturday, Sept. 29 at 3 p.m. against the University of Southern Indiana. Photo courtesy of Jewell Cardinals.